Cake hits our screens riding on waves of publicity conjured solely by Jennifer Aniston’s critically acclaimed performance. Sure, she may have not gotten the Oscar nod she seemed destined for, but it was enough to get the actress, and the movie by association, noticed by the general cinema going public, mainly down to the actress giving her little used dramatic muscles a workout. But does Cake get by on the strength of it’s lead actress alone, or there is something more substantial backing her up? Thankfully, the answer is the latter. Aniston plays Claire Bennet, a woman who has been left broken in both body and mind. Her days are spent attending a support group for sufferers of chronic pain, popping copious amounts of painkillers, and basically alienating all those around her with her bitter attitude. But when Nina (Anna Kendrick), a fellow member of her group, commits suicide, Claire becomes fascinated with her. Befriend her family, Claire and Nina’s husband (Sam Worthington) find they both might be the key to making each other happier. Let’s get Aniston’s performance out of the way first. Yes, it is worthy of all the praise heaped upon it. She has peeled everything we know of her back, from her time on Friends to her recent forays into R Rated comedy, leaving us with something unmistakably real, heart breaking, and darkly humorous. Claires pain, both physical and emotional, is etched on her wan, makeup free face, and you can’t help but be taken in by her. Even when she’s at her most acerbic, you still feel the pain she’s going through. When you see her at her lowest, confronted by William H. Macy, the source of all her pain, in a truly heart breaking scene, you only cheer harder for her to pull it all together. It’s an incredibly nuanced performance, and your picture of Claire is ever changing as director Daniel Barnz and screenwriter Patrick Tobin drip feed you all the information you need to know about her as the movie goes on. She is served incredibly well by a fine supporting cast, with fine turns from Kendrick and Worthington, but it’s Adriana Barraza giving Aniston a run for her money as Claire’s hired help Silvana. They spark off each other wonderfully well, and the caring Silvana is a fully fleshed out and extremely likable character that lends a lot of heart to proceedings. Like Aniston, and the rest of the cast, she feels real, and that’s a credit to Tobin’s script, which balances the heavy material with some well timed gallows humour. The movie moves at a deliberate pace, and it’s a story where everything has meaning, from the smallest gesture to a throwaway line of dialogue. At times, Barnz’s direction may see the story get lost amidst an odd tone that creeps in every now and again. Nina’s ghost appearing to Claire acting as her conscience does feel like a misstep, robbing Cake of some of it’s realism, but everything is pulled together to deliver a thoroughly satisfying experience. 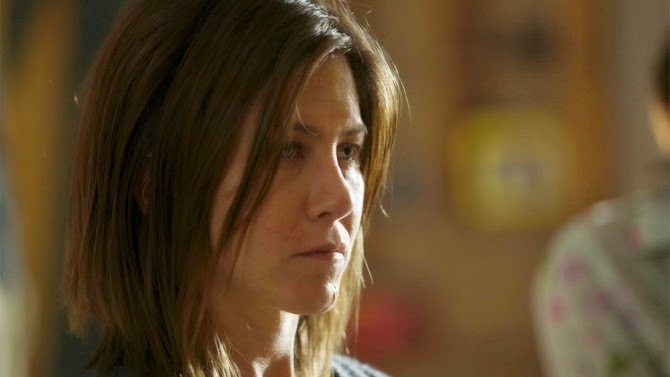 Led by a very different and real performance from Jennifer Aniston, Cake is a heartbreaking, but ultimately uplifting, look at pain and addiction, shot through with a satisfying realism.